Approach to the 5th green taken in the early years of Sotogrande. 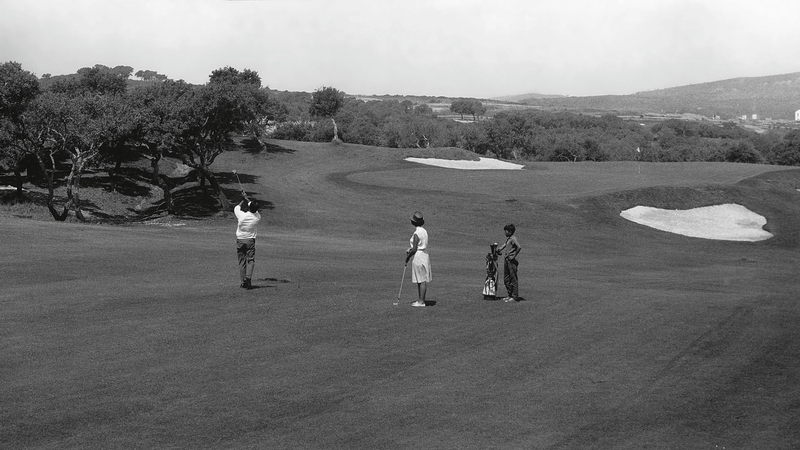 The 1966 Spanish Open was Sotogrande's great international launch. 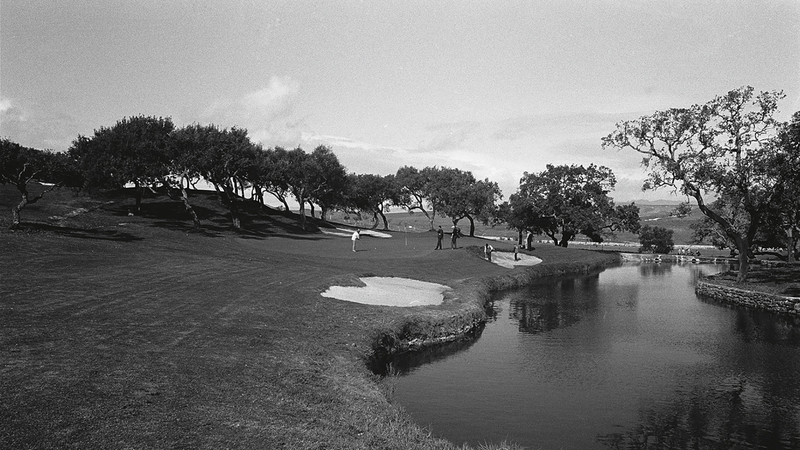 Picture of the 7th hole taken in the late sixties. 1964Officially opened in 1964 Sotogrande was the first course Trent Jones designed in Europe and is blessed with his design philosophy, which consists of building courses perfectly integrated with the natural surroundings which are a great challenge to the better players, but accessible and enjoyable for everyone. The origin of the Real Club de Golf Sotogrande is intimately bound to the creation of the urbanization of Sotogrande in the early 1960´s. Its founder, Joseph McMicking, chose this enclave in the South of Spain to develop the best residential area of the time and as the nucleus and backbone of this ambitious project, the Real Club de Golf Sotogrande was founded in 1964. If something truly characterized McMicking it was his vision of the future and his desire that Sotogrande would last for many, many years. This was why he laid the foundations of his project in completely unknown parameters of quality in the Spain of those days. It is no wonder that he called in the most prestigious designer of the time, R. T. J. to design the Real Club de Golf Sotogrande course. It was the express wish of McMicking that Trent Jones personally choose the land on which the golf course would be built within the enormous property in which the urbanization was located. Sotogrande was the first work of the designer in Europe and marked a landmark in the construction of courses on this side of the Atlantic, not only by the magnificent design which the master Trent Jones realized, but by the innovations that surrounded the project: it was the first course in Europe to be seeded with Bermuda 419 and first to install a totally automatic system of irrigation. 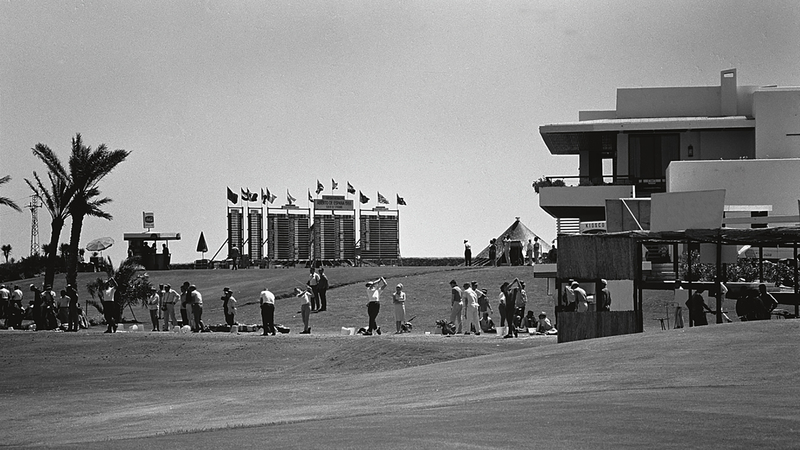 In 1965 the Clubhouse was inaugurated having been built by the architect Luis Gutierrez Soto. 1966In 1966, the Real Club de Golf Sotogrande held its first great tournament with the best players in Europe in the Spanish Open Championship. This was won by Roberto de Vicenzo with 279 strokes. One year later at the age of 44 the Argentinean became the oldest player to win the British Open, after an exciting duel with Jack Nicklaus and Gary Player. The magnificent design of Robert Trent Jones was quickly appreciated so much by both amateurs and professionals, which turned Sotogrande into a prestigious venue for competitions. The Course RSGC is considered as one of the masterpieces of Robert Trent Jones who chose this course as one of his five favorites from more than 500 courses he designed worldwide according to what he wrote in his book GOLF – THE MANIFICIENT CHALLENGE – published in 1988. 1970In 1970 the Sherry Cup was born, the original of the present European Championship of Nations Cup of Real Club de Golf Sotogrande which is presented every year to the best amateur from 20 European countries and gives a big boost to his C.V. to be alongside winners of the stature of Padraig Harrington, Sergio García or Rory McIlroy. In 1973 the VII Ladies European Championship was contested in Sotogrande. The winners were England followed by France, Sweden and Spain. The Club remained part of the Sotogrande urbanization until 1979, the year in which the members acquired the course giving rise to a Members Club which is considered nowadays as one of the best Members´ Clubs in Europe. Sotogrande was the venue for the Spanish Amateur Championship of 1983. The winner was a very youthful Jose Maria Olazabal who later won the Augusta Masters of 1994 and 1999. 1987Five years later, the Club presided over the victory of the brilliant Severiano Ballesteros in the Spanish Professional Championship of 1987. Ballesteros was the number 2 in the world ranking and had won 4 Majors, the British Open in 1979 and 1982 and the Augusta Masters in 1980 and 1983. This did not prevent him having a heroic battle with Pepin Rivero to win the Championship. Seve left wonderful examples of his matchless talent with the shot he holed on the last day from a greenside bunker on hole 16 which virtually sealed his victory. Between 1996 and 2001 the course of Trent Jones together with San Roque Club hosted the Qualifying School for the European Tour. On these 2 courses the European Tour Cards were obtained by players such as Ian Poulter, Geoff Ogilvy, Justin Rose, Niclas Fasth and Nicholas Colsaerts. 1994In 1994, His Majesty King Juan Carlos I granted to Sotogrande the title of Real. From its origin, the Club has had six presidents, D. Alfredo Melián, (1964 to 1979), Mrs. Emma Villacieros de García–Ogara (1979-1989), D. Walter Rodriguez Figueroa (1989–1997), D. José Antonio Polanco (1997–2005), D. Antonio Martín Urquijo (2005–2010) and the present president, D. Felipe Oriol Diaz de Bustamante.